WEALTH INDUSTRY KPIs SOLID BUT TAPER FROM PREVIOUS YEAR SURGE; TOP 10 DOMINATE MARKET SHARE AS DUO PASS USD2trn AUM HURDLE. LONDON – The global wealth management industry had a solid business year in 2014 in terms of financial results for the operating model. In spite of financial market uncertainties and currency volatility most lead players experienced overall growth in client volumes. However, the latest KPI growth rates came off the higher ratios in the previous reporting year. The financial year also heralded a landmark breakthrough for two operators – UBS and Morgan Stanley – as their assets under management (AUM) figures surged beyond USD2 trillion (Figure 1). According to The Global Private Banking Benchmark 2015 released today from Scorpio Partnership, AUM for the over 200 industry players annually assessed moved upward by an average 3.4% and operating profits also improved by an average of 3.3%. However, these solid figures are tempered by continued pressure on the operating efficiency measured by cost-income ratios. In the latest report the industry average rose 90 basis points to 84.4% (Figure 2). “This is a complex moment in the history of our industry. The operating model is facing major growing pains to accomodate the expectations of financial groups for wealth management divisions to deliver sustained high margin results. The good news is client volumes and demand for wealth services are strengthening for many. But the bad news is the industry is still tackling major compression factors in terms of costs versus income. Some are not moving quickly enough with rates of growth slowing,” said Sebastian Dovey, managing partner of Scorpio Partnership. Y-o-Y comparisons for Citi, Pictet, Lobard Odier and Barclays are not available due to changes in reporting methods. assets are 39% (equivalent to USD785 billion) of total AUM. Bank of America Merrill Lynch’s Global Wealth and Investment Management division AUM includes Merrill Lynch Global Wealth Management and US Trust, Bank of America Private Wealth Management. The firm reports total client balances of USD2,498.0 billion including USD902.9 billion in AUM and a further USD1,081.4 billion of brokerage business for this division. We have excluded assets in custody of USD139.6 billion, banking deposits of USD245.4 billion, and loans and leases of USD128.7 billion for this client segment. UBS Wealth Management Americas’ AUM is made up of invest assets and includes those client assets managed by or deposited with UBS Wealth Management Americas for investment purposes, across branch networks in the US, Puerto Rico, Canada and Uruguay. Citi’s AUM is for accounts over USD1 million including Citi Private Bank assets (CPB targets clients with a net worth of USD25 million) and Citi Personal Wealth Management assets (CPWM targets mass affluent clients). Total AUMs do not exclude assets under custody. AUM for JP Morgan’s Private Banking segment of USD428.0 billion excludes assets held in custody, brokerage, administration and deposits. The addition of these activities gives total private banking client assets of USD1,057.0 billion. Goldman Sachs’ high net worth client assets under supervision are USD363.0 billion. For comparison, the firm reports total assets under supervision of USD1,178 billion, which includes assets under management of USD1,027.0 billion, (those that earn a fee for being managed on a discretionary basis including mutual funds, hedge funds, credit funds and private equity funds for both institutional and individual investors). Deutsche Bank AUM is based on the invested assets of the UHNW wealth business. 2014. Client assets for overall wealth, brokerage and retirement division was USD1,600.0 billion at Q4 2014. Northern Trust’s AUM of USD224.5 billion for its high net worth client base does not include assets under custody (USD515.7 billion). (or currency equivalent). This exludes assets under custody. Based on analysis of reported financials from over 200 wealth management business lines across the globe, this year’s worldwide ranking saw few changes among the top cohort. Aside from UBS and Morgan Stanley breaking through the USD2trn barrier, the majority of the market leaders remained in stasis. Source: Scorpio Partnership. Note: Table is based on the performance of over 200 institutions that make up the entire report. “Looking ahead, in the intensively competitive market it will be the details that make the margin of difference. The winners will be those that pay the most detailed attention to the optimised commercialisation of the client journey and benchmarking this among peers. Aside from the annual benchmarking, our unique collation of HNW and UHNW client satisfaction ratings of firms identifies who is leading in this context,” added Scorpio Partnership’s Dovey. Now in its 14th year, the influential annual Scorpio Partnership Private Banking Benchmark, estimates that the global industry now manages USD20.6 trillion in investable assets on behalf of high net worth investors. Amid this total industry AUM data point, the market share concentration among the largest houses is significant. 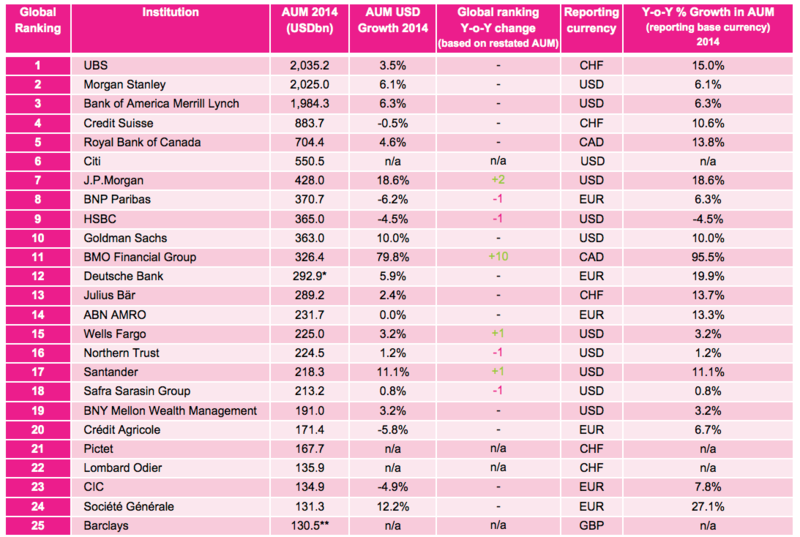 The top 10 global operators in AUM terms collectively manage 47.1% of the market (Figure 3). UBS holds a 9.9% industry share. Source: Scorpio Partnership. Note: The total AUM of USD20.6 trillion is the entire estimated market size in terms of investable wealth managed by the industry. The US operators continue to dominate the market share ratios driven largely by their domestic franchises. According to various industry estimates the US remains the largest market of opportunity for HNW business. Equally, the scale of the market opportunity is also reflected in the strong growth in AUM posted by US operators. The 10 leading firms are registering an average AUM growth ratio of 7.1% – over twice the global average (Figure 4). The ranking of the above 10 firms is drawn from the global table of results produced for The Global Private Banking Benchmark 2015 applying the same methodology of assessment as with firms outside the United States. 1 Morgan Stanley’s AUM reflects private clients assets for clients with accounts above and below the USD1 million threshold. Fee-based client assets are 39% (equivalent to USD785 billion) of total AUM. 2 Bank of America Merrill Lynch’s Global Wealth and Investment Management division AUM includes Merrill Lynch Global Wealth Management and US Trust, Bank of America Private Wealth Management. The firm reports total client balances of USD2,498.0 billion including USD902.9 billion in AUM and a further USD1,081.4 billion of brokerage business for this division. We have excluded assets in custody of USD139.6 billion, banking deposits of USD245.4 billion, and loans and leases of USD128.7 billion for this client segment. 3UBS Wealth Management Americas’ AUM is made up of invest assets and includes those client assets managed by or deposited with UBS Wealth Management Americas for investment purposes, across branch networks in the US, Puerto Rico, Canada and Uruguay. 4 Citi’s AUM is for accounts over USD1 million including Citi Private Bank assets (CPB targets clients with a net worth of USD25 million) and Citi Personal Wealth Management assets (CPWM targets mass affluent clients). Total AUMs do not exclude assets under custody. 5 AUM for JP Morgan’s Private Banking segment of USD428.0 billion excludes assets held in custody, brokerage, administration and deposits. The addition of these activities gives total private banking client assets of USD1,057.0 billion. 6 Goldman Sachs’ high net worth client assets under supervision are USD363.0 billion. For comparison, the firm reports total assets under supervision of USD1,178 billion, which includes assets under management of USD1,027.0 billion, (those that earn a fee for being managed on a discretionary basis including mutual funds, hedge funds, credit funds and private equity funds for both institutional and individual investors). 7 AUM for Wells Fargo’s Wealth Management division includes client assets and deposits of USD225.0 billion at the end of the fourth quarter 2014. Client assets for overall wealth, brokerage and retirement division was USD1,600.0 billion at Q4 2014. 8 Northern Trust’s AUM of USD224.5 billion for its high net worth client base does not include assets under custody (USD515.7 billion). 9 BNY Mellon Wealth Management provides investment management, custody, wealth and estate planning and private banking services to clients. BNY Mellon Wealth Management’s AUM has USD191.0 billion in private client assets this is for accounts with more than USD1 million (or currency equivalent). This exludes assets under custody. 10Bessemer Trust’s assets under supervision at December 31, 2014, totaled USD103.4 billion including USD47.3 billion in custody and directed trusts. The core business provides investment management, custody, trust, estate administration, tax, and other financial services. Assets held in fiduciary or agency capacities are not included in the Statements of Financial Condition. 1.Scorpio Partnership is a London-based strategy and research specialist on the global wealth management industry and codifying the HNW client journey. In addition to its industry benchmarking, Scorpio Partnership’s unparalleled insight into the market is based on over 55,000 interviews with millionaires and billionaires and 12,500 professional advisors across 35 global wealth centres. The firm has now undertaken enterprise-wide client journey insight programmes for 40% of the world’s largest private banking institutions. To date in 2015, Scorpio Partnership has either won or been runner-up for awards for Thought Leadership in Asia, Europe and the United States for its insight work in the respective regions (WealthBriefing). 2.The Scorpio Partnership Global Private Banking Benchmark is the leading analysis of the international wealth management market from strategists Scorpio Partnership. This year’s report includes data based on results from 203 private banks around the world with total assets under management of USD16.4 trillion. 4.The Global Private Banking Benchmark 2015 collects data from a representative sample of wealth management institutions around the world from which to develop industry key performance indicators. To ensure consistency in the analysis, we seek data relating to the firm’s actively managed high-net-worth private client assets, including discretionary portfolio management, advisory portfolio management, securities or brokerage accounts, own mutual funds, term deposits, fiduciary deposits, savings accounts and managed trust assets. More specifically, we aim to identify data relating to private clients who hold more than USD1 million (or the local currency equivalent) in actively managed assets with the firm. We note that not all firms conform to this reporting methodology. For further details on the reporting guidelines and the data reported for individual firms, please contact us directly. 5.Scorpio Partnership is a wholly owned Aon Hewitt company.